Reports of antisemitism have nearly doubled in the past year in Wales, according to a charity for the safety of Jews. 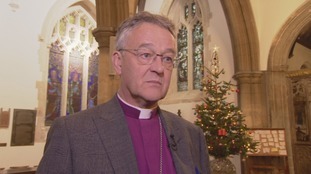 The Archbishop of Wales says we need to find our inner quiet and shut out the Christmas noise. The Archbishop of Wales wants politicians from all parties to work together. The Penrhys Pilgrimage began in medieval times, running from Llandaff Cathedral to the holy shrine at Penrhys. The Muslim Council of Wales and Muslim Engagement and Development (MEND) have responded to UKIP AM Gareth Bennett's comments on the burka. More than 80 young Muslims in South Wales have been taking part in late night sports sessions to stay active during Ramadan. The new Archbishop of Wales, John Davies, will be enthroned at Brecon Cathedral this afternoon. The Bishop of Swansea and Brecon, John Davies, was elected as the thirteenth Archbishop of Wales in September. During today's service he will be placed in the Archiepiscopal chair and presented to the congregation. The chair, or throne, is a wooden replica of the Chair of St Augustine in Canterbury Cathedral, and was given to the Church in Wales in 1920. Today's service is expected to last an hour. All the main denominations contacted by ITV Cymru Wales had experienced a decline of at least 50% in their membership since 1990. The new Archbishop of Wales has been chosen following a day of discussions. The Rt Revd John Davies, Bishop of Swansea & Brecon, secured the necessary two-thirds of votes to be elected the 13th Archbishop of Wales. He will succeed recently retired Dr Barry Morgan, who held the office for 14 years. Six serving Welsh diocesan bishops were in the running for the post, including two women. Who will be the next Archbishop of Wales? The next Archbishop of Wales, who will succeed recently retired Dr Barry Morgan, will be decided this week.